This recipe can use roasted, panfried, bbq, poached or what ever leftover cooked meats or seafoods are in your pantry. Preparation + cooking times; 25 mins. 1.Beat the eggs in a bowl and set aside. 2. Heat the 2 table spoons of oil in a nonstick frying pan over medium heat. Add onion, curry leaves and chillies, cook for 1 to 2 minutes. 3. Add salt, pepper, turmeric and cinnamon cook for 10 seconds stirring constantly. Add the meat and cook for another 30 seconds, stirring constantly. 4. Spoon cooked meat mixture into beaten eggs. Mix cooked meat and egg with fork until well combined. 5. Heat the 1 table spoon of oil in same frying pan on medium heat. 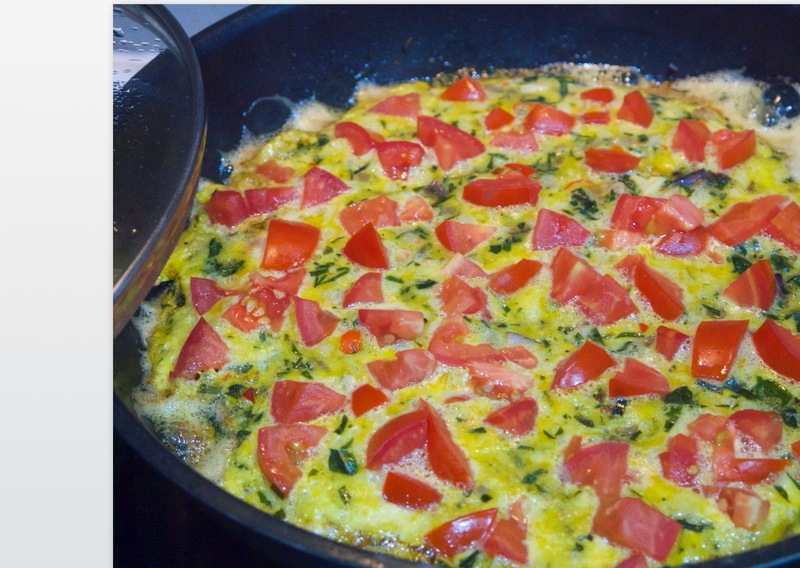 Pour the egg mixture onto pan, sprinkle the tomatoes over the mixture. Cover and cook on low-heat 10 to 12 minutes or until surface is set and cooked. Curry leaves may be substituted by mixed herbs such as parsley, chive, sorrel, dandelion, cress or leaf vegetables such as spinach, kale, silver-beet, beetroot leaves or asian greens. Choose the flavouring of spices to your taste. Purple onion be substituted by any other onions, shallots, leek or green (spring) onions.